Now established for nearly 20 years, this family-run restaurant has become one of the most frequented restaurants in the area. The menu reflects many of the traditional Indian dishes but also has an attractive selection of house specialities. 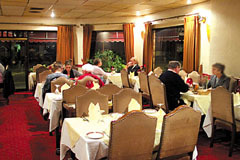 The restaurant is very comfortably appointed and professionally run where every customer is afforded a very warm welcome and friendly and attentive service. The Sunday Buffet/Brunch is very popular and children under 10 eat for half price. Open every day noon-2.30pm, Sun-Thur 6-10.30pm, Fri-Sat 6-11pm. All major credit cards accepted (not Diners). No service charge.